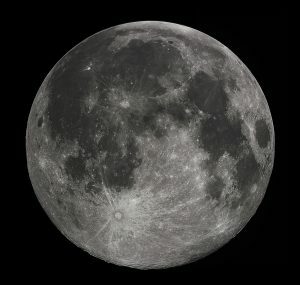 Read the moons sections, and you will learn about how moons have developed over billions of years, and how important our moon is to the Earth. Now let us look into different moons from different planets. So, like planets that exist inside and outside of the solar system, it’s the exact same for moons. There are exomoons, which are moons that exists outside of the solar system, and there are moons that we know that exist inside of the solar system, that orbit solar system planets. Note that exomoons are only a theory right now, but are however very likely. So, as exoplanets have been confirmed and can be detected, they are too far away right now with current technology to see, it’s the same for the moons that may orbit these planets. We don’t know enough about these moons yet. So with that, let us focus on the different moons that have already been discovered that orbit around the planets in our solar system. These moons are weird and wonderful places. Most planets in the solar system have moons, the Earth with one moon, Mars with two, and the giant gas planets with many. However Mercury and Venus do not have any moons that orbit them. See table below of the Qty of moons for planets in the solar system. Some of the dwarf planets and even some asteroids have moons orbiting them. So it’s not just the planets. All of these moons are fantastically different, and are weird and wonderful in different ways. As technology improves we will learn even more about these strange worlds than we know already. Most scientists actually believe that these moons are the worlds where we may find alien life. How fascinating! For a list of moons in our solar system, refer to NASA link below. # 1. There are total of 336 known moons in the solar system. # 2. Ganymede, one of Jupiter’s moons, is the largest moon in the solar system. # 3. Jupiter has the most moons of the planets with 67. Q. 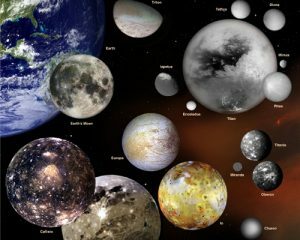 How many known moons are there in the solar system? Q. What planet in the solar system has the most moons? Q. 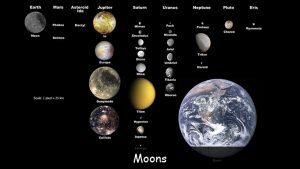 What planets in the solar system do not have moons? Q. What are moons outside of the solar system called? Key Vocabulary Solar System. Exoplanets. Exomoons. Dwarf Planets. Asteroids.